Feeling adventurous? Continue your wildlife search along the road system of Wrangell Island, which stretches 30 miles from north to south. A network of unpaved and often bumpy forest roads provides access to camping, hiking and wildlife viewing. Sitka black-tailed deer are frequently seen along the roads. Watch for moose as well. Both black and brown bears live on Wrangell Island; three particularly good spots to look for bears are Earl West Marsh, Thoms Creek and the Thoms Lake Trail. All are located at the southern end of the island. Be sure to familiarize yourself with bear safety tips before venturing out. 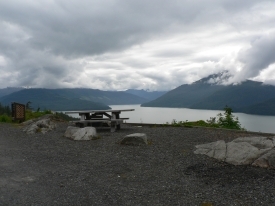 There are many first-come, first-serve campsites scattered around Wrangell Island for overnight trips. These campsites allow you to watch for wildlife in the late evening and early morning, when activity is highest. Visit the volunteer camping hosts at the Nemo Point recreation area for details, and also for information on recent wildlife sightings. Road maps of the island are sold at the USDA Forest Service’s Wrangell Ranger District. A high clearance vehicle is recommended for some roads. The town of Wrangell sits at the north end of Wrangell Island. Head south of town on Zimovia Highway to access the other roads on the island.